Pig Paralysis: This is an emergency! Paralysis is the inability to voluntarily move a part or parts of the body. THIS IS AN EMERGENCY!!! The paralyzed part (legs, neck, etc.) may be rigid or stiff or, more commonly, relaxed and flaccid. Some pigs will lack muscle tone in the paralyzed limbs/extremities. Severe pain can often accompany paralysis, and treating for pain is an important part of the overall therapy, regardless of cause. For some cases of paralysis, you may need a referral to a specialist in neurology or surgery to maximize the chance that your pet will walk again. If there was an injury that resulted in paralysis, you need to take special precautions when moving your pig for transport. There are nutritional deficiencies that can contribute to temporary paralysis as well. So keep an eye on your pig should diet be an issue. Click here to learn more about nutritional deficiencies. 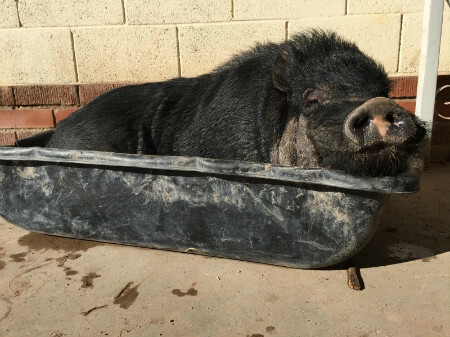 ​**Pigs may suffer from Dippity pig syndrome which can mimic the sign/symptoms of paralysis. Click here to read more about this neurological condition that is NOT life threatening. If you know your pig has sustained a fall or jumped from a couch and now doesn't have the ability to walk? That is a potentially serious condition that needs to be addressed by a vet. Calm the pet. If necessary, cover with a blanket. Contain the pig in order to transport her to the veterinary hospital in a crate or something similar for her safety. Transport the pet using one of the techniques described. Do NOT try and treat this yourself. If the condition is time sensitive for treatment purposes, the sooner your vet is able to clinically diagnosis and start treatment, the greater the chances are of recovery. Do not assume she won't bite. Do not encourage the pig to move about. Do not medicate her with over-the-counter or prescription medications unless instructed to do so by a veterinarian. Do not delay evaluation by a veterinarian. This is an emergency. Paralysis can also be associated with traumatic episodes such as falls, being struck by a motor vehicle, or fights with other animals. When paralysis is associated with trauma, fractures or instability of the spine should be suspected. It is extremely important to immobilize the spine before and during transportation. The inability to walk can develop suddenly (with or without a history of injury). The ruptured disk causes swelling and inflammation of the spinal cord and severe cases often need surgery immediately. Paralysis of this type should be considered an emergency and your veterinarian or an emergency facility should be consulted immediately. Sometimes a pig can suddenly become paralyzed because of a chronic medical issue such as a spinal cord tumor or infection (like a spinal cord abscess) that has grown big enough to put pressure on the spinal cord resulting in the inability to walk. HOWEVER, you cannot always tell by looking from the outside, so it is best to treat sudden paralysis as a traumatic injury and use special precautions when moving your pig. Paralysis is a serious matter but many patients/pigs can hope to walk again with the right treatment. A considerable investment on the part of the pet owner in terms of time, effort and money may be required. Many patients will need help with physical therapy, walking and bodily functions (such as urination) for several weeks after the injury. Your veterinarian or specialists can help you make decisions on the right treatment plan to get your pet back to health as soon as possible. You may ask around and hear that someone else's pig recovered with little help or minimal vet involvement, but these types of injuries are very individualized and your pigs injury could be much more severe. Do not wait to get your pig treated. If initial treatment doesn't help, go to a more specialized treatment facility such as a University vet teaching hospital who will likely have more appropriate diagnostic tools available. You can click here to see what Universities are near you. There are some mobile vets that have portable X-ray capabilities, but your pig may need a MRI or CT scan to give a definitive diagnosis and come up with a good treatment plan. If your pig is squealing constantly in addition to paralysis, this would typically indicate your pig is in severe pain, likely panicked from not being able to get up and move and needs to be seen urgently. This is an injury that will likely not get better on its own, but will need some kind of veterinarian's intervention. Time is often NOT on your side in most cases. These kind of injuries can be life threatening, paralysis can migrate or worsen to include respiratory muscles ceasing the ability to breathe, so immediate vet care is most important in these types of situations. Gracie's Acres took in Sonny after he was sent to UT after a fall resulting in the need for surgery. The initial thought was that he would recover and do well, unfortunately, that is not how it panned out for sweet Sonny. His surgery was a success, however, he never regained his ability to walk and although a wheelchair was purchased for his use, he did not grow to be fond of it. He grew bigger and though very much loved and cared for, developed some kind of urinary complication. His bladder ruptured due to some kind of obstruction and he had to be rushed back to the vet for treatment. After the procedure, he was sent back home and once Susan saw something "wasn't right", she scooped him up to take him back to the vet, unfortunately, he did not survive. Please take falls seriously, pigs are resilient, but they can easily be injured by jumping or falling off of couches or porches. Rest in paradise sweet angel. 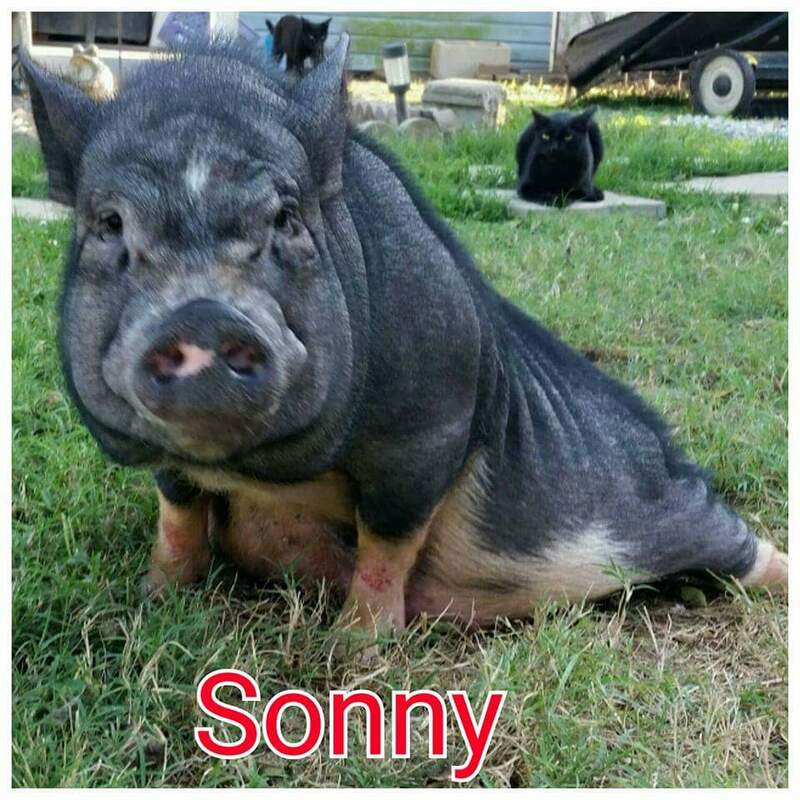 Sadly, Sonny passed away recently from urinary complications. Our condolences go out to Susan Swafford of Gracie's Acres.